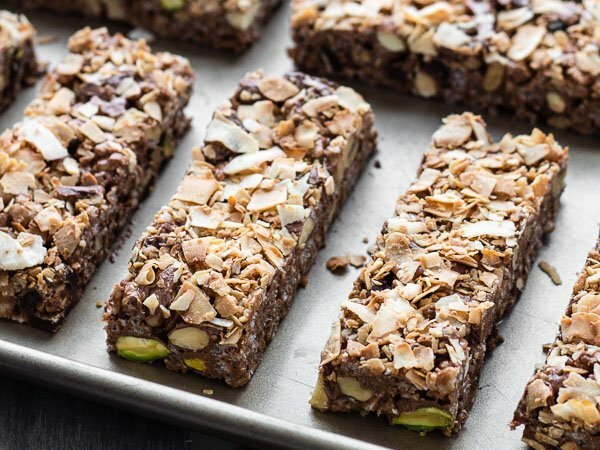 These melt-in-your-mouth chocolate & peanut butter energy bars taste light and crispy, but don’t be fooled, they will power you through an intense workout without giving you a sugar rush or feeling heavy in your stomach. 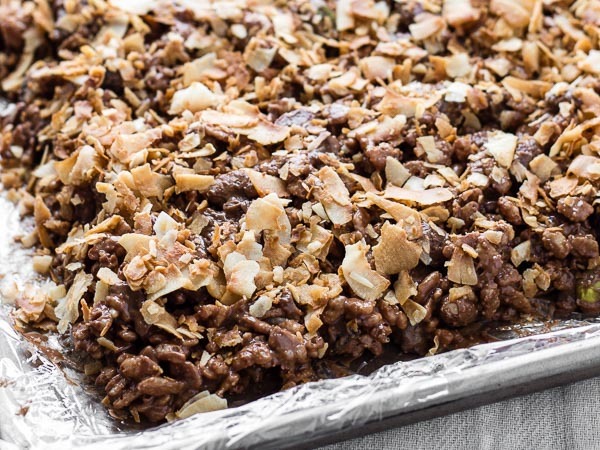 Nuts, dates, brown rice krispies, and toasted coconut chips are held together by bittersweet chocolate melted into peanut butter. 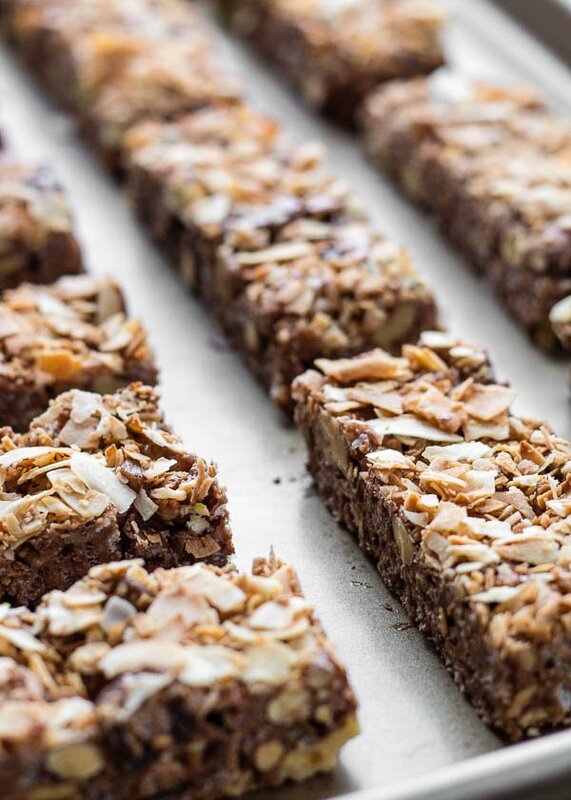 Super simple and no-bake! So… little old me has started rock climbing, skiing again, trampolining, and ice skating this winter. What does this all mean?? It means I need MORE SNACKS to power me through. Womp womp. 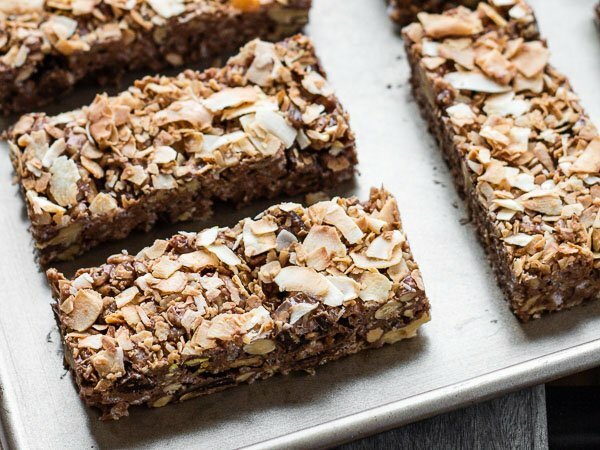 These energy bars are really mysterious hunger killers. They’re not dense or brick-like at all, and they have none of that weird protein bar flavor. Instead they’re creamy, crispy, slightly crunchy with chewy bits of date, nutty, and barely sweet. One bar keeps me satisfied for two hours of rock climbing and even after that, I don’t feel the need to devour a vegetarian whale of a dinner. Considering I am a human who needs to munch on something every half hour, that’s pretty solid. Not gonna lie, it will look like a total blobby mess when you first dump the mixture in the pan, but don’t worry! Just pop it in the fridge or even the freezer. It will solidify magically, as chocolate does, and then you can trim off the edges with a big sharp knife, cut the whole thing into neat little rectangles, and eat the scraps. You know how they say the edges are best? They really are. The only thing about these bars is that they do need to be kept cold to hold together. You can store them in the fridge or, seeing as it’s winter, just keep them in the back seat of your car so you can grab-and-go! For my fruit & nut mix, I used dried dates, almonds, pistachios, walnuts, and pecans. You could also add or swap in apricots, sweet cherries, peanuts, cashews, and hazelnuts. Toast coconut flakes for 5 minutes in a 250 °F oven. Remove and set aside to cool. 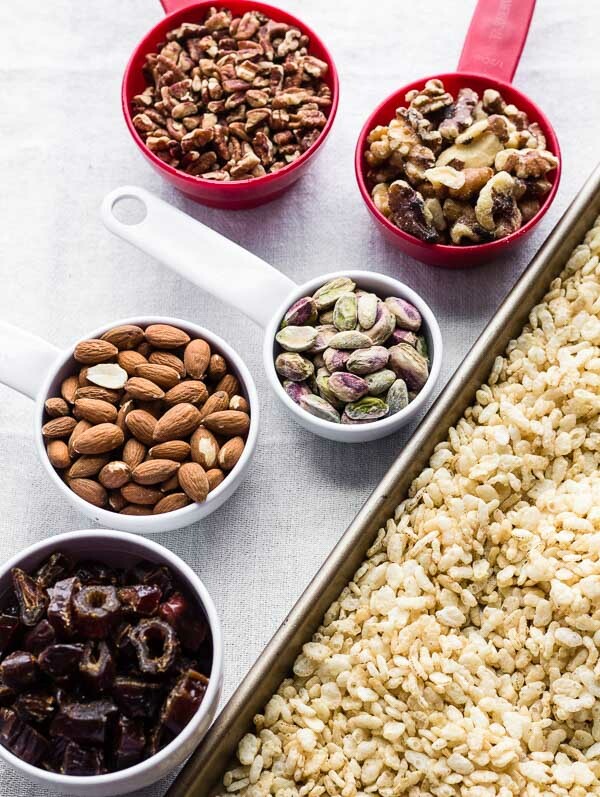 Add dried fruit, rice krispies, and nuts to a large mixing bowl. Toss to combine. Melt chocolate in a heatproof bowl over a small pot of simmering water. Once melted, remove from heat and whisk in the peanut butter until smooth. Pour it over the dry mix and gently stir until evenly incorporated. Line a baking tray with plastic wrap, parchment paper, or wax paper, then dump the mixture onto the baking tray. Pat it into a rectangle roughly an inch thick. Mine did not touch the edges of the baking tray. 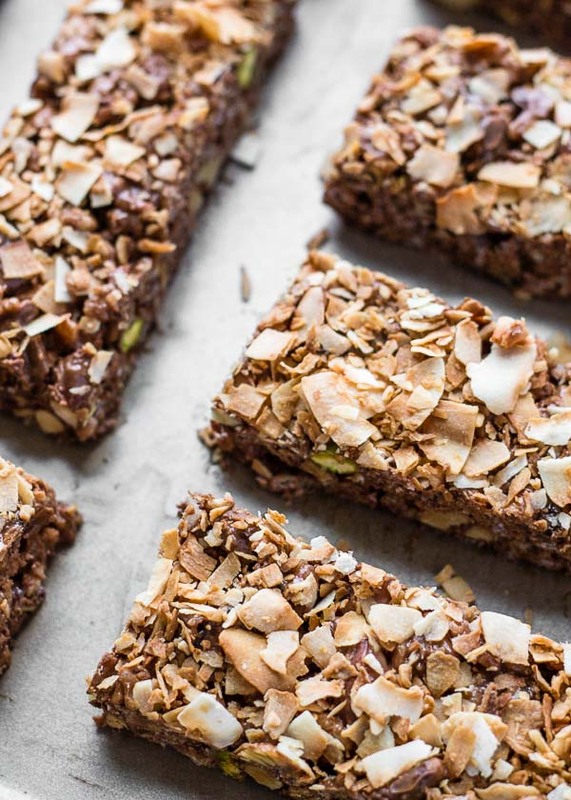 Sprinkle the toasted coconut chips on top. Place the baking tray in the refrigerator for 30 minutes (or in the freezer to shorten the time). The mixture will firm up once chilled. Holding on to the plastic wrap or paper, slide the entire chilled sheet onto a cutting board. Trim the edges, then cut the sheet into bars using a sharp knife. Do you toast the nuts first? Use raw nuts? Eager to test these on my kids! I’ve never been able to enjoy peanut butter in sweet things, is there something wrong with me? I love it in savoury dishes, but the all-time favourite PB + Chocolate combo? meh. 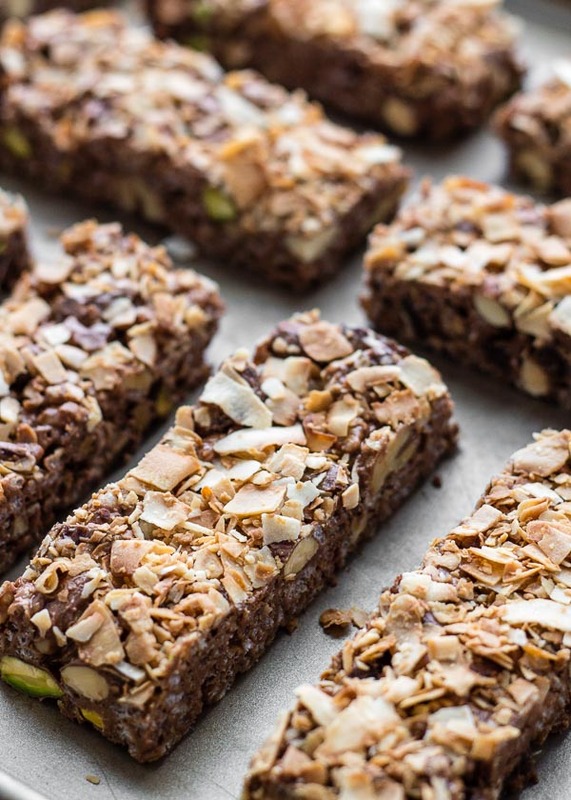 I will be trying your beautiful bars with almond butter though! Love the idea of having melted chocolate hold the bars together. 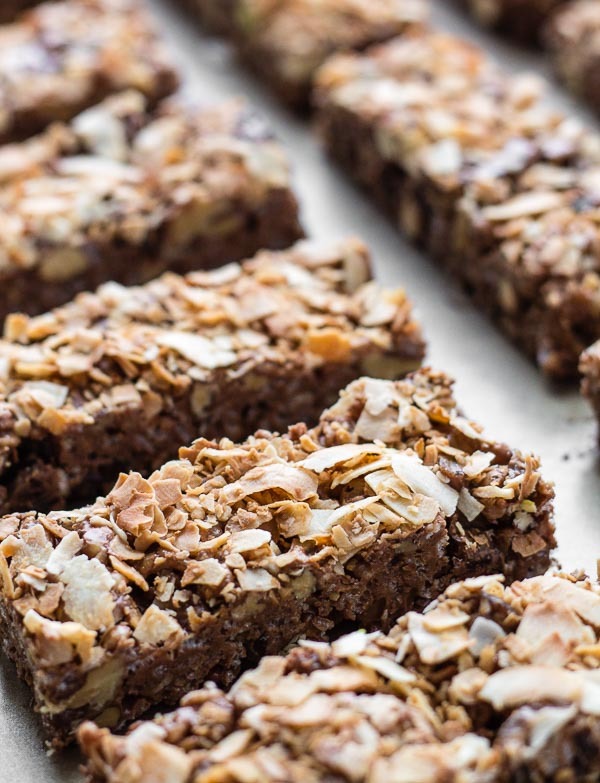 This recipe reminds me of why I love home-made goods so much – these bars are so much better than any other store bought energy bar! These are totally my kind of snack! Such beautiful photos too. These have everything I want in a bar. They look wonderful! Tis true, they are pretty chock full 😛 Thanks for stopping by!